On July 5th, at the Hirohiko Araki Jojo Exhibition press conference it was announced that Jojo's bizarre adventure: The Animation was in production and will premiere in October. 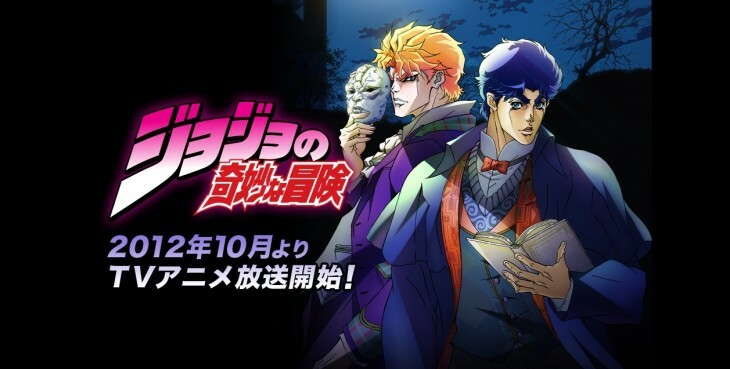 Jonathan Joestar will be voiced by Kazuyuki Okitsu, Dio Brando by Takehito Koyasu (voice of Admiral Aokiji from One Piece), and Erina Pendleton by Ayako Kawasumi (Ko Aoki from Bakuman). Opening theme will be Jojo~ That Blood Destiny~ by Hiroaki "Tommy" Tominaga while the Ending will be YES's Roundabout. Jojo's Bizarre Adventure, created by Hirohiko Araki was serialised in Weekly Shonen Jump from 1987 to 2002, before being transferred to the monthly seinen magazine Ultra Jump in 2004. The story centres on the misadventures of the Joestars, a powerful family with English roots. Each member of the bloodline has a star shaped birthmark above their left shoulder blade. Dio Brando, the original nemesis of the Joestar family, and his descendants have this distinguishable mark also, a results from Dio's 'theft' of Jonathan Joestar's body and inheriting the Joestar genes as well. The series spans several generations, with each part featuring a descendant of the Joestars as the main protagonist along with a large cast of characters. It is unkown how much of the manga the anime will cover, but during the preview reel, all eight JoJo's seen thus far were featured. The anime will air in Japan on October 6th.